For nine decades, the Hotel Saranac, Curio Collection by Hilton has been the centerpiece and constant cultural and social hub of the idyllic Adirondack village. Adventurers have historically come to seek out this magical village, not only as a place for rest and recuperations, but also as a basecamp for further adventures of their own making. There’s no end to the local activities and attractions to experience in the Adirondacks. Whether looking to hike to remote mountaintops or experience the local charm and history of downtown Saranac Lake, the possibilities are endless, and always waiting to be explored. Adventure and natural beauty await in the surrounding mountains and wilds of the Adirondacks, and the Hotel Saranac, Curio Collection by Hilton offers a complimentary shuttle and cruiser bicycles to get guests on their way. Visit the Campfire restaurant for ‘Adirondacks-to-table’ comfort food, or enjoy cocktails and a speakeasy vibe at the Great Hall Bar. The Terrace is a cozy outdoor spot to savor mountain views and a crackling fire pit. Indulge in a massage or pedicure at Ampersand Spa and Salon, or work out in the fitness center. Kids will love special welcome gifts and the shuffle board table, and Academy & Main boutique has sweets and souvenirs for everyone. No matter the time of year, there’s always something to experience here in Lake Saranac. With a humming and cozy downtown and the full possibilities of the Adirondacks surrounding the village, the opportunities for adventure are unlimited - stretching as far as your imagination may take you. Steps away from the historic Hotel Saranac, visitors can explore properties on the National Register of Historic Places such as the Adirondack Railroad, Berkeley Square Historic District, the Trudeau Sanatorium, individual Cure Cottages, Will Rogers, and Paul Smith's Electric Light and Power and Railroad Company. Neighboring the hotel, Historic Saranac Lake at the Saranac Lake Laboratory Museum, is a must-see, especially their historic walking tours. Festivals, educational experiences, tours, and events are ongoing at the hotel and in downtown Saranac Lake. 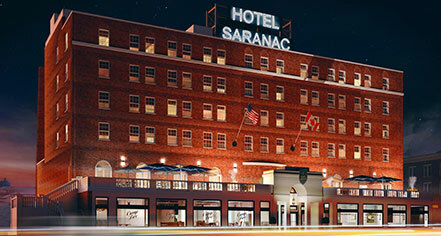 Hotel Saranac, Curio Collection by Hilton, a member of Historic Hotels Worldwide since 2017, dates back to 1927. The second floor lobby extends practically the full length of the building and is modeled after the Grand Salon of the 14th century Davanzati Palace in Florence, Italy; it is three times the size and half the height of the original. Airport Transportation: An airport shuttle may be arranged through the hotel's concierge; complimentary to SLK. Cancellation Policy: Cancel 7 days prior to reservation to avoid a penalty. Extra Person Fees: Extra-person charges may apply and vary depending on rate, room, or package booked. Parking: Self-parking: complimentary. Valet parking: $24.00. Secured: Not Available. Covered: Available. In/Out Privileges: Available. Shuttle Service: Local shuttle service available; complimentary. 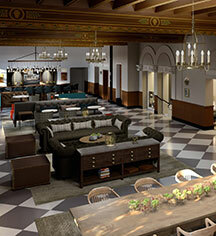 Learn more about the History of Hotel Saranac, Curio Collection by Hilton .